I also made a new gallery check the drop down menu Digital Portraits where I will post all the Portraits for this unique Collection. Thank you to all of you that commented to my last post. I really love to know your opinion which I value immensely, it means a lot to me. I am very happy that you like my Concept for this new idea I am launching. At this moment I am really inspired creating this Collection of Artistic and one of a kind Digital Portraits, this portrait it is the #2. In my last post I explained that while creating Portrait #1 I used photos found on internet on Pinterest some of them were photos from professional photographers like the model I used for the Portrait “Proud”. This time I used one of “YOU” here from the WP community. I am quite sure that many of you will probably recognize her soon, especially if you are a follower of her beautiful Blog. She is SOULDIERGIRL I love her and her photography she is one of my dear friends here on the blogosphere. 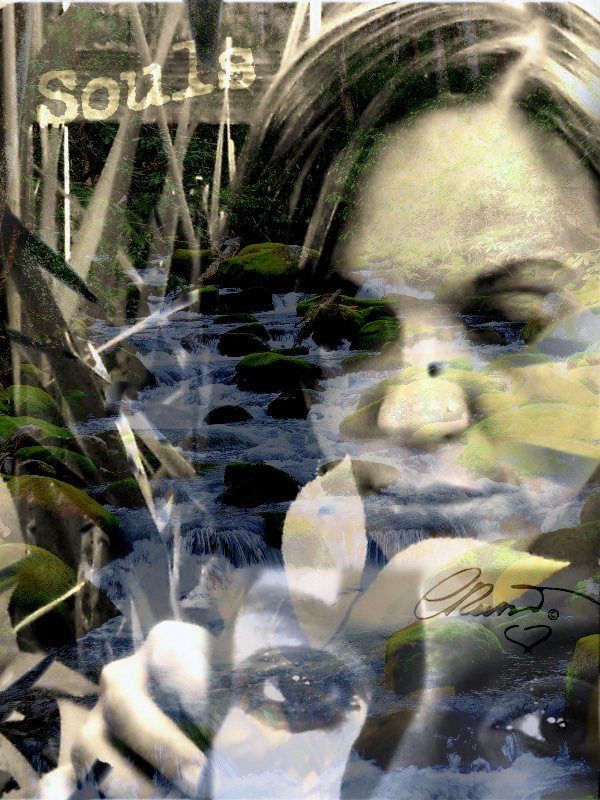 I used 3 of her own photos from her Blog and one of mine (the water stream). I loved very much to create this portrait and I really like how it turned out. This time I didn’t wanted to use a Model or Professional Photos, but Souldiergirl has great photos and you can see what I have been able to create to make this portrait. I came with this Concept to mix nature with humans and create a unique and very different kind of photo portraits…let’s say that I like the idea to create very unusual portraits filled with all my inspiration, experience, art and soul like in all my unique creations. If you’re interested eventually in purchasing a custom and unique portrait like this one using your own personal photos or not, I can create your personal and unique portrait. For info and details please contact me. Note: I respect all the Rights and Copyrights. Credits for the photos used to create this portrait goes to their owners. The finished portrait created as result of blending and layering the photos used it is my own Digital Artwork and has my Copyright© Carolina Russo. Wow, that is awesome, Carolina. I am sur our Souldier Girl loves it. It is very beautiful, you are so skilled! Keep it up, Carolina! That truly is your alley. Omg Carolina!! I don’t even know what to say. I am in tears here. I love you so much my beautiful sister. I just love you so much. This is one of the deepest and kindest things anyone has done for me- what a true surprise. you are such a radiant soul of light and purity. I want to hug you! The latest work from soul sister Carolina has left me speechless and so deeply touched. Please take a looksee and follow this radiant spirit and artist. Xxxo Carolina- love you. Of course I do! Your work is fantastic and with the incorporation of nature, I am simply blown away. They love it too Carolina!